Pictured above: Blake Willimann (7) one of her two consecutive kills to held her team win the second set. Hermann, Mo. -- Thursday night concluded the finals of Hermann’s Volleyball Invitational Tournament. It was a night filled with gut wrenching games that had fans on the edge of their seats. New Haven (13-6) collided against Pacific (14-3) in the winners bracket. The Rocks finished second in Monday’s pool play and Pacific placed first their pool on Tuesday. The two teams have played each other seven times in the past six years, New Haven holding to a one match, having won four out of the seven times. Elise McDonald had a team high 16 kills in the three set match. Kelsey Pecaut had eight of her 11 kills in the second set. Washington would then knock off the rocks in two sets (14-25), (17-25). The Rocks came out flatter than a flat tire in the first set, nothing seemed to go their way. Pacific mounted a 6-15 lead and New Haven never able to get things going in the first set losing 13-25. Saying the second set was a thriller is an understatement. It would take 56 points to determine the winner. The Lady Rocks came out completely reenergized ready to rock the house. Pacific was not afraid one bit, making the second a thriller to watch. Early on, the Rocks were able to jump out to a 10-5 lead to have Pacific battle back, tying the score at 15 all. You would have thought McDonald and Pecaut had rocket launchers as arms. They combined for 17 of the teams 19 kills in the set. It was Senior Blank Willimann who would smoke back-to-back bombs, tying the match up. In the third and final set, the Rocks continued to battle Pacific keeping it a close match after McDonald recorded her 15th kill of the night to tie the set at 14. Pacific came right back, scoring three straight points off a triphector of kills, taking a 14-17 lead and not looking back. The Indians advanced to the Championship match and the Rocks would have to turn around and play in the 3rd place game against Washington. The Lady Rocks had already expelled so much energy and emotion. Having to turn around and play again is tough for any team to do, no matter how good they are. 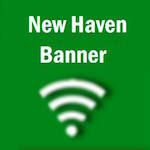 New Haven played well in the third place game, Coach Sharen Speckhals said, “In both sets, it seemed like we just could not get over that little hump.” Both sets were closer than the final scores reflected. Washington went on to win in two sets 17-25, 14-25. The Lady Rocks will play at Fatima on Monday. They will then enjoy their final 6 games of the regular season at home beginning on Wednesday when they will host Borgia.